Revolution-Over is an installation consisting of three unique insights into the lives of the family affected at first by the Second World War, then the communist regime and subsequent revolution in former Czechoslovakia. Three stories are told by grandmother, mother and daughter revealing the deep undercurrent of oppression, which resulted in a unified national resistance and the elation that came after the symbolic uncovering of family histories and personal stories. 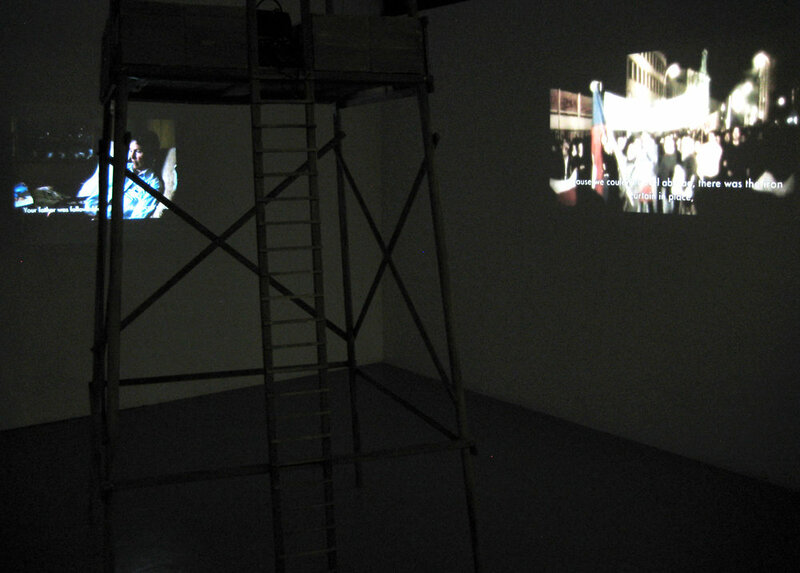 IMAGES | Mariana Jandova, In the Light of Days to come, 2012, video projection, installation views,| Images courtesy of the artist. Revolution-Over is an installation consisting of three unique insights into the lives of a family effected at first by the second world war, then the communist regime and subsequent democratic revolution in the former Czechoslovakia. The space of the installation invites reflection in a darkened room whose only sources of light are flickering projections on the walls of the gallery. A tower made of raw wood stands at the centre of the room, at once resembling watch towers found on the edge of Czech woods where hunters wait for game, and those that used to occupy borders of Czechoslovakia strategically positioned by the military to capture and shoot refugees trying to escape. The space itself is a place of reflection, an observatory where the stories of three generations of Czech women are simultaneously presented for contemplation. Three stories are told by grandmother, mother and daughter revealing the deep undercurrent of oppression which resulted in a unified national resistance and the elation that came after the symbolic uncovering of family histories, personal stories and experiences which had to remain hidden for so long. Even though these events occurred in former Czechoslovakia, the themes this work represents are universal - all around the world there are still many people who experience oppression imposed on them by their governments. It therefore speaks of hope and belief in the impermanence of these structures - that all totalitarian regimes are in the end unsustainable, just as communism was in Czechoslovakia. Yet it is also deeply personal, because these events are in a way only a backdrop to the life drama of each of the individuals involved, every situation is inevitably and uniquely coloured by the individuality of the participants. The family here is not only a witness to the events that shaped the future of a nation, they are active participants in their own life story which happens to be set in these circumstances. But more importantly they represent the continuity of life itself amid a constantly changing environment. Despite all that may befall there is an inherent strength in knowing that regimes, governments, countries may come and go, but the family, that unit of individuals bound together by blood and/or love, has been there always, since the beginnings of human history and will remain as long as our species exist. Mariana Jandova is a multi-disciplinary artist, born in Czechoslovakia, who completed her degree at the Victorian College of the Arts as well as a postgraduate course in social work at the University of Melbourne. Her practice stems from her ongoing interest in the psychosocial dimension of human life, the intricacies of human perception and the way we create and structure the world around us.